When your on the road for a long time a town like Manizales is exactly what you hope to stumble across. The sky held a wonderful space between the mountains and the cityscape. Volcan Ruiz at over five thousand meters peers down over the city. From the city you can see the cloud forest wrap around its midriff and its snow covered peak tower above the microclimate. For decent sized city there is only one place to be, on the 5 km road that runs along its jagged ridged peak. Humble and ordinary enough to not be engulfed by tourists, yet a quietly intellectual and cultural hub. Just far enough off route to displease the gringo trail yet accessible and cosmopolitan. Lively and arty, yet unassuming, understated and a perfect example of everyday life. Aside from the mountain there was nothing majestic, or incredible to note about the city but its atmosphere was enchanting. I spent a few days just wandering the streets, chatting to curious and friendly folk, reading and writing in coffee shops. 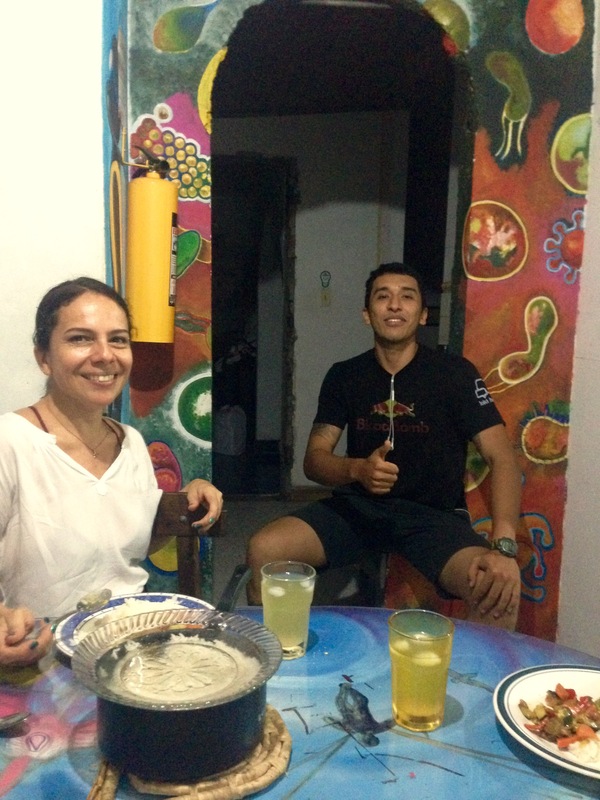 Maria taught me all I needed to know about Colombian food, which we spent entire day talking about, cooking and eating. I wanted to stay. I wanted to stay for a long time. 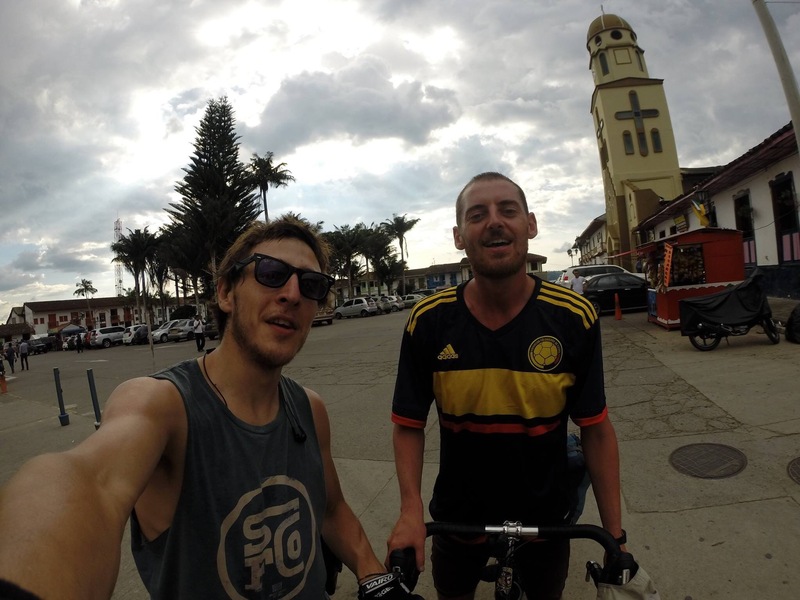 But I met Martin, the first biker I came across in South America and we joked and clicked off the bat. Completing a journey he started five years earlier after the death of a friend he bounced around the room as we met, telling me of Huraz in the mountains of Peru, terrible, terrible he proclaimed. His Argentinean Spanish was a ninightmare to understand but as a solo viajando it didn’t ever matter much. I think we are used to not often being understood and context is irrelevant, just pitch in with what seems appropriate and alls good. He gave me a days grace to say goodbye to Manizales and we left together. He would spend the morning smoking pot and doing all sorts of this and that as I would twiddle my thumbs, stretch my limbs, entertained by his manner. Then with most of the day gone we would race off and kill the day in four hours. We found hot springs in the hills of the chorizo capital of colombia Santa Rosa and spent a Sunday evening between the thermal pools and various 75 meter water falls to cool off and take a much needed massage. Martin could really ride and I enjoyed playing catch up, we laughed a lot, his boundless energy was infectious. 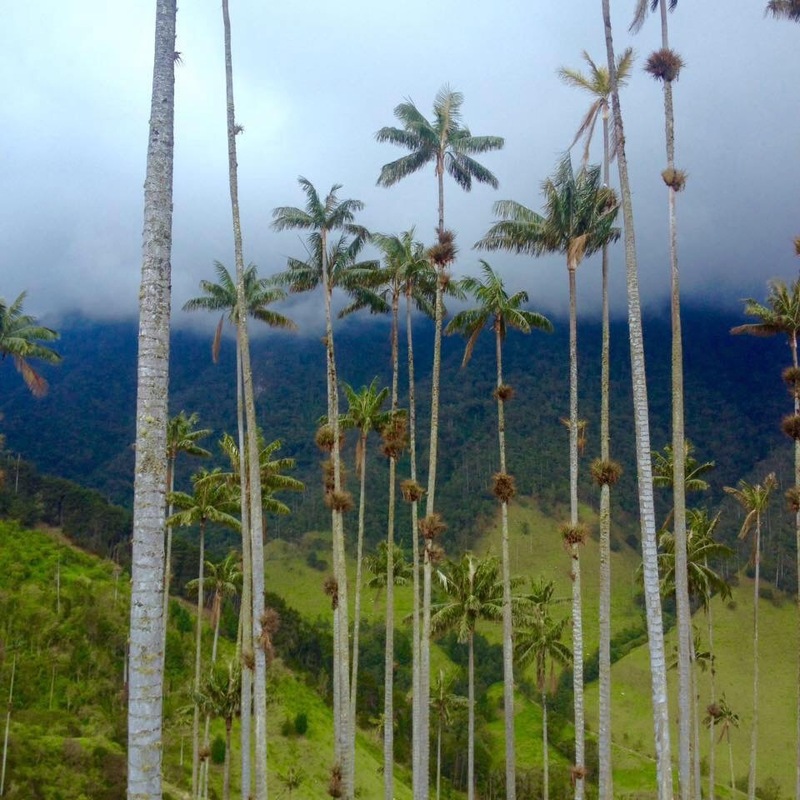 Racing on to touristy Solento, high above the coffee farms I decided to take a break to explore the wax palms of Valle de Cocora which grew as tall as 80 meters, as Martin had his lady to meet in Bogota. I was solo again but happy we had met and our opportunity to be reunited when I hit his home town of Ushuaia. Despite being a little touristy Solento was a nice place for a break and famed for its game of throwing rocks at gunpowder after a few beers. A genius alternative to pool. After Solento the young uni town of Armenia. I stumbled across the foundation for ideas for the peace, response to discontent over the peace agreements and little consideration for rural communities and farmers. This was a hot topic all over Columbia and I hung around as the students climbed trees and strapped banners to them. They adorned a huge banner destined for bogota and enthusiastically listened to speeches by unknown academics, farmers and ordinary folk. I was impressed by Colombians involvement and their forward approach to exploring these issues. 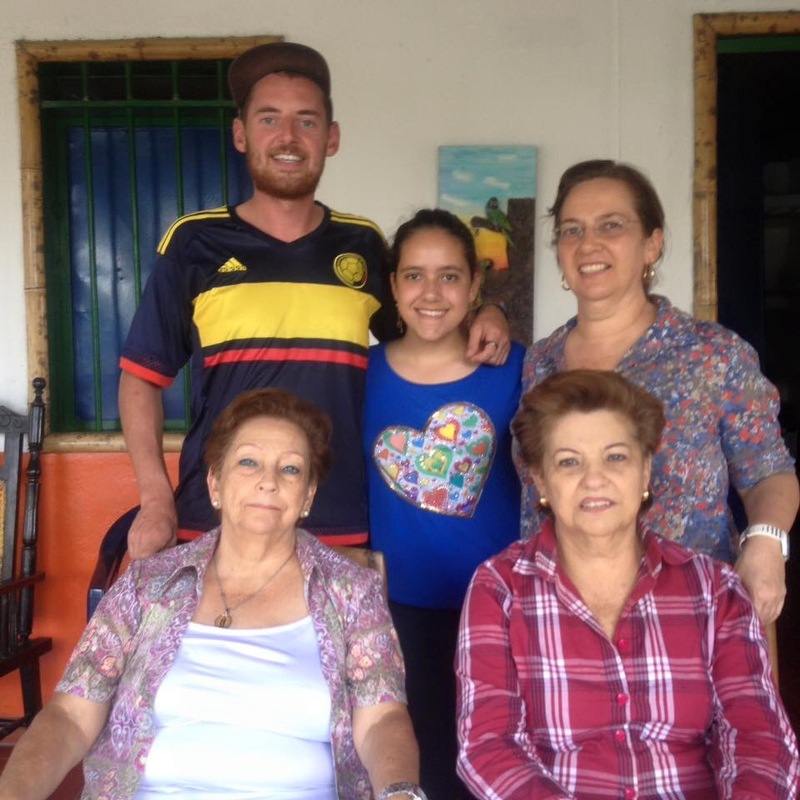 I met up with brilliantly political and intelligent Gonzalo who took me to his aunt’s finca, a small farm, showed me around the plants and then left me with his sister and two aunts. The ageing ladies were full of life and wanted to talk about the queen more than i did. The finca was wonderful, sporting three types of avocado, manderines, corn, plantain, mangoes which we ate in abundance. Eager to help out I climbed the avocado trees and collected sack after sackful whilst been eaten alive by millions of ants. Then mandarins, then everything else. 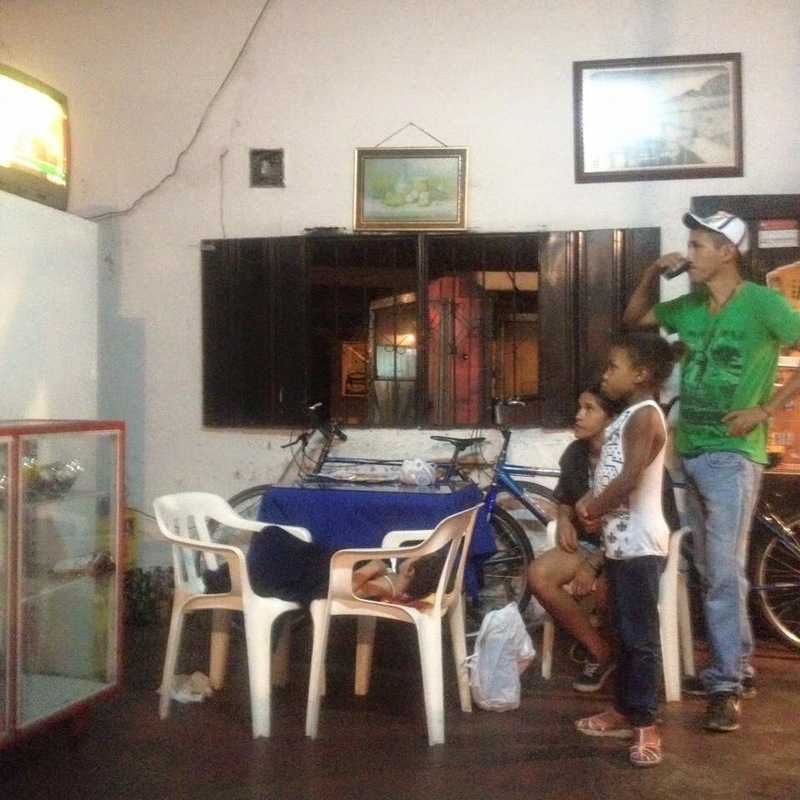 I tried to leave but was held captive for a few days to help Gonzalo’s niece with her English. I didn’t mind so much. I enjoyed the routine of chatting with the old ladies as they curled their hair every morning, ate loads of food and slept as I would work on my farming skills and play with the little ones. Leaving the coffee region things levelled out a little and riding was smooth but hot for the next while. I was getting into a comfortable routine and loving Colombia. The roads are completely full of motorbikes and having someone ride along side me and chat away was a daily occurrence. Sometimes when I’m getting tired a ten minute conversation with a dad and his son whilst riding away is all it takes to get that second wind. I even had a young motorcyclist insist on trying to wrap a rope around the front of my handlebars to drag me along, I told him it was a bad idea and it was as the rope snapped and whipped me in the face. Colombian people seemed to be the most naturally curious people and also incredibly polite with it too, such a pleasure when riding solo. The flat lands fell into Colombias third city, Cali. Humid and dirty it had a much more authentic feel to it and home to salsa I tried to dance with my feet. A new experience, the only thing was, I realised after a while of trying that I don’t actually like salsa music, quite the relief. I found a good friend in Sebastian and rode around the city with him, Jenny and co looked after me at the green house, a home from home and took a camping trip into the national park of Pance that had been a long time closed due to guerrilla activity. I found a nice group of travellers to hang out with and kicked a ball around some more, watched some films, chilled in the pool before hitting the road again. More flat lands after Cali were a breeze and I stopped at the base of the mountains in Santander de Quilachillo a town famous for the most absurdly indulgent choladas. A pint glass of slush puppy, pineapple, passion fruit, mango, apple, ice cream, caramel, nuts, chocolate, cheese and wafers, covered in sauce. And ate two. Checking into a little hotel, a familiar figure poked her head down the corridor. Safia, who’d started in Alaska the day after me was there with barley any skin on her legs. She’d been smashed into by a motorbike the month previous and had recovered and finished her first day of riding. Such a crazy surprise we continued on together as she worked her confidence back as we rode through the supposed coco plantations and Colombias notorious cocaine producing region. There were hoards of military guarding such and we waved as we past into the mountain town of Piemdamo. It had a rough and ready feel to it and we checked out the morning market where the indigenous folk would come down from the hills to sell all sorts of produce, opium included. I opted for herbal tea. I left my bike in Cali and bussed to Bogota and through my brief stay it seemed like a really exciting city with lots of subculture, graffiti and arty stuff. I was really enjoying the vibe, met some cool people and had a good explore, which unfortunately ended in me and my new found Colombian friend Maurico running through the forest and coming across two unfriendly chaps with machetes. They roughed us up a little and ending up on the floor with a blade as long as my forearm to my neck I gave up my phone. I’d been expecting something like this to happen at some point on my trip and the mental preparation had me surprisingly calm. They also took my 2 dollar watch which was an unfortunate sign of desperation. Leaving us on the ground we were told to look down into the forest as they left up the tracks, warning us if we looked back they would kill us. At that point Maurico seemed startled snd suggested we ran. I suggested we sat tight and only on leaving did I pick up on Mauricio’s concern. 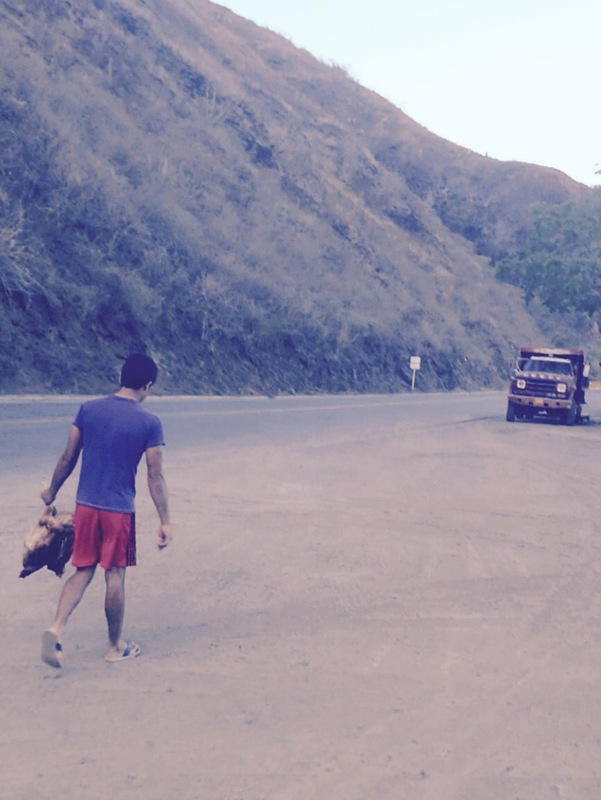 He told me he was genuinely worried, as a gringo, in the forest, unabashed they might kill me. At that point I realised I’d developed a bit of a reckless sense of invulnerability through my good fortune so far. I’d felt incredibly welcome and safe in Colombia and was reluctant to reassess this but didn’t want to be naive. There are poor and desperate people everywhere in the world and I could only feel sorry for those guys and put it down to wrong place wrong time. Unfortunately I’d lost some precious photos, and worse Mauricio lost a sentimental ring. Still we had our heads, things must roll. Only the coming weeks would say if it would affect my confidence and sense of adventure, I sincerely hoped not. Iam glad to catch up with your experiences, after long time. Enjoyed it.